At Applechem, we believe in effective, user-friendly solutions that are, above all, consistently high quality. 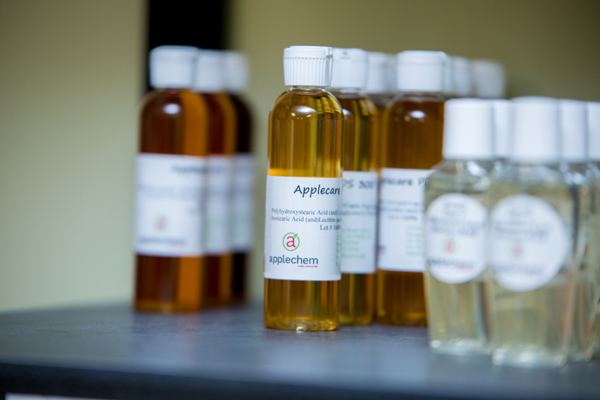 An Applechem product should represent a quality-of-life improvement for formulators on the bench as well as the compounders in the production plant. As an industry-leading cosmetic technology company, Applechem develops cutting-edge materials for innovative, eco-conscious cosmetic formulators. Applechem specializes as a supplier of diverse intermediates and ingredients for suncare, personal care, and cosmetic formulations. What truly sets Applechem apart from other cosmetic tech suppliers is not its 18,000-square-foot New Jersey-based facility, but its team of progressive thinkers driven to develop more reliable, broadly-effective products and solutions with an emphasis on user friendliness. From the onset, we have made it out mission to push the envelope in technological innovation in order to expand the range of options for cosmetic formulators worldwide. Today, we create ingredients and materials that solve formulation issues plaguing the skincare and cosmetic industries for years. We have developed a transformative non-ionic associative thickener that boosts viscosity in personal cleansing formulations containing high amounts of fragrance while still maintaining foaming properties. We have also engineered natural dispersions that provide the most efficient combination of high-transparency, broad spectrum protection, and SPF performance in a stable, liquid dispersion. We have also created an advanced dispersing system for uncoated, hydrophilic color pigments, allowing formulators to disperse these pigments into oil at astonishing concentration levels; an advanced synthetic polymer blend that is a flexible, anhydrous structurant with many unique applications in personal care and color cosmetic formulations. Other products we have innovated include a completely natural analogue for synthesized, bacterially-fermented hyaluronic acid and organically modified hectorite clay. In addition to engineering this revolutionary products, we believe in strong, responsive technical support and customer service to assist our customers with any questions they may have about these intermediates and ingredients. We also recognize that when it's time to scale up from lab experiments to large-batch productions, it’s our responsibility to provide a stable product with consistent, reproducible quality. Our clients can count on us to deliver this quality every time. We believe in cultivating strong relationships. Our distributors are symbolic of this. Found all around the globe with representation on three different continents, our distributors embody our core values, beliefs, and mission to create possibilities worldwide.